Our product range includes a wide range of chemical heat exchanger, kettle reboilers, corrugated tube heat exchanger, shell and tube heat exchanger, fixed tube sheet heat exchanger and 'u' tube heat exchanger. 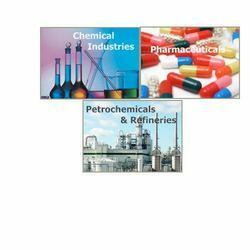 We are offering a wide range of Chemical Heat Exchanger. As a vacuum steam condenser. Image depicts a typical steam heated kettle reboiler. Kettle reboilers are very simple and reliable. They may require pumping of the column bottoms liquid into the kettle, or there may be sufficient liquid head to deliver the liquid into the reboiler. 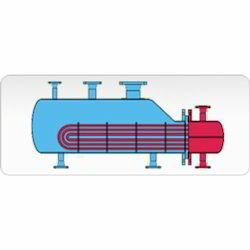 In this Reboiler Heat Exchanger, steam flows through the tube bundle and exits and condensate. The liquid from the bottom of the tower, commonly called the bottoms, flows through the shell side. There is a retaining wall or overflow wall separating the tube bundle from the reboiler section where the residual reboiled liquid (called the bottoms product) is withdrawn, so that the tube bundle is kept covered with liquid. Higher heat transfer co-efficient: corrugated tubes increase the turbulence in the flow that enables a more effective mixing and agitation that generates a higher heat transfer coefficient compared to smooth tubes at the same conditions. In many cases, the heat transfer co-efficient in Corrugated Tube Heat Exchanger is almost doubled. Economical: The cost of Corrugated tube heat exchanger is 25% To 50% less than the cost of a plain tube heat exchanger for the same duty. When exotic materials are used significant savings can be made on the overall cost of the unit. Reduced Fouling: Corrugation carries a self cleaning effect that reduces fouling on the tube surface. Less fouling means smaller heat exchanger and longer production cycles. Low maintains & operating cost. Small product and service hold up volumes due to the compact size of the Heat Exchanger. Longer running times without stopping for cleaning. Higher response to CIP cleaning. Homogeneous Thermal treatment due to the mixing capacity. Smaller footprint due to Corrugated Tube Heat Exchanger's smaller sizes. Versatile: CTHE’s are versatile since they are able to process different products in the same installation. 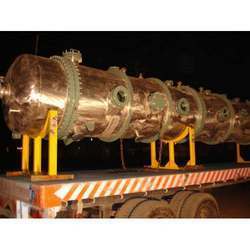 We are offer design and fabrication of shell and tube type heat exchangers build in accordance with ASME code section and division1, ASME code stamps include U.R, Um and TEMA code standards. 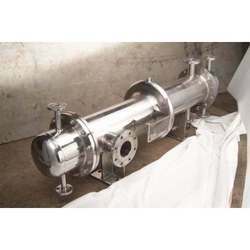 Straight tubes are expanded on two opposite tube-sheets, which are welded directly to the shell to form this Fixed Tube-sheet Heat Exchanger. The tube bundle of Heat Exchanger consist of U shaped tubes, which can be removed by disassembling the head. Mechanical cleaning of pipe interiors not possible because of the bent areas, only chemical cleaning possible.